UPDATED: Tue., June 19, 2018, 10:16 p.m. The bats finally came around. 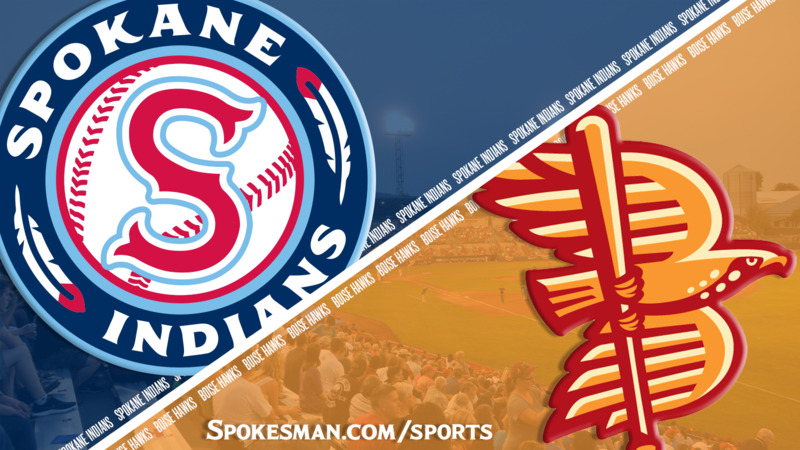 Isaias Quiroz homered twice, Starling Joseph and Curtis Terry added one apiece and the Spokane Indians pounded out 10 hits and beat the Boise Hawks 8-4 in the finale of a Northwest League season-opening series on Tuesday at Avista Stadium. Quiroz blasted a three-run shot in the second inning and added a long solo blast in the eighth. It was the first-two homer game of his pro career. Joseph led off the fourth inning with a solo shot and Terry hit his third in three games in the eighth. “We got some really big homers from guys,” said manager Kenny Holmberg. Starter Ryan Dease (1-0) went five innings and allowed two runs on seven hits and one walk with three strikeouts for the Indians (2-3). Dease, 19, made his first NWL appearance of the season. He made a spot start for Low-A Hickory on June 12 and pitched five shutout innings, allowing five hits and no walks with three strikeouts, earning the win. The Texas Rangers fourth-round pick out of high school in the 2017 MLB Draft pitched in 11 games with four starts for the Rangers Arizona League affiliate last season, going 3-1 with a 2.05 ERA and 0.909 WHIP over 22 innings with 7.8 strikeouts per nine innings. Dease got Matt Hearn to fly out to lead off the game but ran into some heavy contact. Cade Harris laced a single to right, then Daniel Jipping crushed a homer to straightaway right for a 2-0 lead. Danny Edgeworth, who came into the game tied with Spokane’s Curtis Terry with six RBIs to lead the NWL, smacked a single to left. But Dease settled down to coax a flyout and struck out Jeff Bohling to end the threat. Hawks starter lefty Alec Byrd had no such trouble, striking out the side in the bottom of the first, including a pair looking. Dease retired the first two batters in the second, but found hot water again. Jonah McReynolds bobbled a routine grounder at third for an error, then Hearn smashed a single to left. But Dease got Harris to pop out to short to keep it a two-run deficit. The Indians erased that in the bottom half – and then some. Diosbal Arias and Terry extended their good starts to the season with singles to start it out. Byrd came back to strike out Joseph looking and Juan Ventura swinging, but Quiroz barreled up a full-count fastball over the left field fence to give Spokane a 3-2 lead. The Hawks (3-2) put two on in the third, but Terry snagged a sinking liner at first and went to the bag to complete an unassisted double play. Spokane added on in the third. J.P. Martinez led off with a walk and with Martinez running, McReynolds lashed one to the left-center gap that made it to the wall for an RBI double. Joseph greeted Hawks reliever Mike Bunal rudely in the fourth, sending the righty’s first pitch screaming over the right field fence for a solo shot, his first of the season, and a 5-2 lead. The offense picked back up in the fifth. With one down, Miguel Aparicio singled and Arias was grazed with a pitch. Terry then roped a liner the opposite way for single and right fielder Harris’ throw was up the line, allowing Aparicio to slide in safely. Holmberg turned to the pen in the sixth, ending Dease’s night. After the rocky first inning, Dease delivered four shutout innings and turned in the Indians’ fourth straight start of four-plus innings and two earned runs or fewer. Francisco Villegas took over and recorded two quick outs. No. 9 hitter Kennard McDowell ripped one back up the box that hit Villegas and knocked his glove off, but he recovered the ball and got the out at first. Boise loaded the bases against Villegas in the seventh on a pair of walks and a single. A run scored on a flyout to the wall by LJ Hatch and another on a single by Bohling, a 2017 Gonzaga grad and 17th round pick of the Colorado Rockies. That brought Holmberg out to make a change to Emmanuel Clase, who got Greg Jones to sky out to center to end the damage. Terry made it a three-run game again in the eighth with a line-drive homer to left and two batters later Quiroz blasted his second of the night in the same direction. Blake Bass pitched a scoreless ninth inning. Injury update: According to Indians manager Kenny Holmberg and pitching coach Jono Armold, starter Hans Crouse should be able to make his scheduled start on Thursday against Tri-City, as long as everything goes well between now and then. Crouse opened a cut on a finger on his pitching hand while warming up for his opening night start on Friday and was scratched. Published: June 19, 2018, 9:20 p.m. Updated: June 19, 2018, 10:16 p.m.